This stock reportedly has the longest dividend-paying streak among American companies -- and its total return has crushed the market over the long-term, to boot. There are many things to love about dividend-paying stocks. Carefully selected ones make for wonderful sources of current income, while reinvesting dividends allows you to accumulate more shares of stock, which can turbocharge your total returns over the long term. Moreover, dividend stocks in general have been shown to outperform non-dividend payers over the long haul. Companies that have great long-term records of paying dividends make for an ideal pool from which to fish for high-quality dividend stocks. A relatively small number of companies across various industries have track records of paying uninterrupted dividends for more than 100 years. These include such well-known companies as industrial titan General Electric, personal care products giant Colgate-Palmolive, beverage king Coca-Cola, and oil behemoth ExxonMobil, which have paid dividends for 118, 122, 124, and 135 consecutive years, respectively. A century? How about 201 years! A century-plus of paying dividends is mighty impressive, but there's one little-known small company that leaves the above mentioned corporate goliaths and all other American companies in the dust when it comes to a dividend-paying streak, as it's been paying dividends for 201 consecutive years! That's right -- since 1816. America was a young country then, with a mere 18 states in the union in April 1816, when our dividend superstar was founded by a group of business people concerned about fire. The company? The York Water Company (NASDAQ:YORW), the oldest publicly traded water utility in the United States. 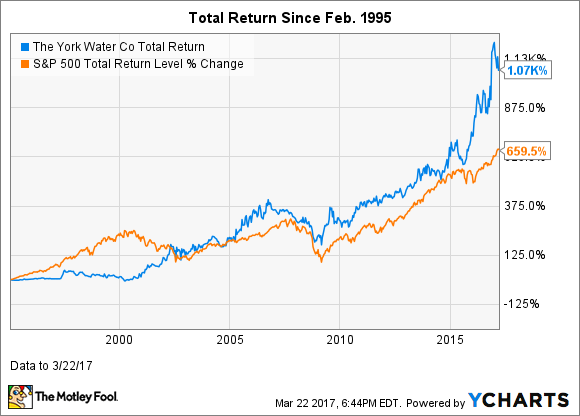 York Water is a small-cap stock that pays a dividend that currently yields 1.9%. It's not surprising that a water utility is believed to have the longest streak among American companies of paying consecutive dividends. Water utilities have several traits that make them models of revenue and earnings consistency and predictability. For one, they can count on steady demand for their product regardless of economic conditions. Moreover, water utilities are regulated and natural monopolies, so they have high barriers to entry. In addition to having to comply with federal water standards, their core businesses are regulated by the public utility commissions in the state or states in which they operate. Among other things, these agencies regulate rates utilities can charge. The fact that water companies' core businesses are regulated doesn't mean that they don't have the potential to earn higher rates of return on their invested capital than their state regulators allow. Some water utilities operate market-based businesses. York Water doesn't operate such businesses, or at least none of any significance. However, most of the larger water companies do. For instance, American Water Works Company (NYSE:AWK), the largest investor-owned water and wastewater utility in the United States, builds, operates, and maintains water systems for military bases under long-term contracts with the U.S. government. While these contracts are obtained on a bid basis, companies can set their own rates. American Water also has a business that sells water and related services to natural gas exploration and production companies operating in the Appalachian Basin. The York Water Company provides water and wastewater services to a total of about 194,000 people through approximately 66,000 service connections. Its territory includes 48 municipalities located in York and Adams Counties in the south-central region of Pennsylvania. 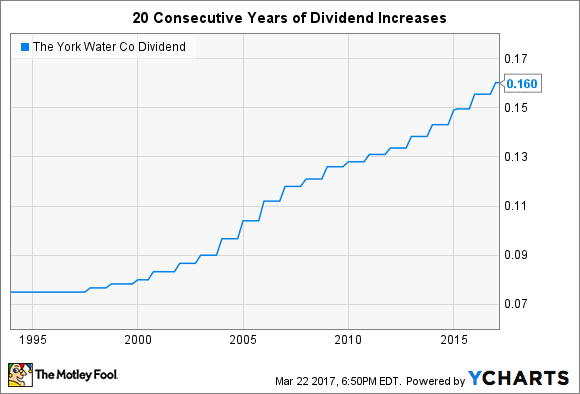 In addition to York Water's dividend streak of 201 consecutive years being second to none in corporate America, the company has a solid record of increasing its dividend. York Water has hiked its dividend for the past 20 consecutive years. While dividends are very important to many investors, they're not everything. Most investors care about total capital appreciation, which is stock price appreciation plus dividends. Maximum chart period shown. Data by YCharts. 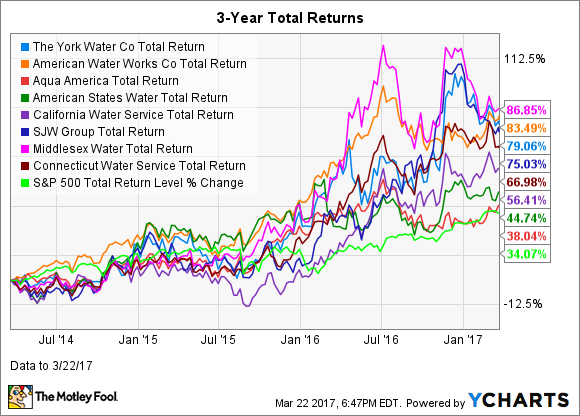 York Water stock's more recent return picture is also attractive, both relative to the broader market and other water utility stocks. York Water's three-year total return ranks third behind Middlesex Water and American Water Works among the eight water utilities that operate in the U.S. that have market caps over $300 million. I personally favor American Water Works among water utilities because its industry-leading size and geographic diversity provide it with greater potential than its smaller peers to grow by acquisitions. However, York Water is the safest water utility, in my opinion, which makes it a solid choice for conservative investors. Notably, York Water had the best free cash flow (FCF) among water utilities operating in the U.S. over the last 12 months, and was only one of two companies that had a positive FCF, with Aqua America being the other. FCF is a better metric than earning on which to gauge a company's performance, as "earnings" are simply an accounting metric -- and, of course, dividends are paid out of cash. Moreover, York Water's cash dividend payout ratio (dividends paid divided by FCF) is only 41.1%, indicating that the company has room to continue to increase its dividend.